As I have mentioned earlier, I now work in a client facing investment counselling role. As the second word in the name suggests, the role involves a lot of conversations. Considering the average age of my area is probably 65, conversations often mean that the clients want to get a much larger share of the talking pie. When I heard yet another colleague cribbing about client kitna bolta hai (how much the client talks! ), I started introspecting about why is it so difficult to listen, like really engage in active listening? 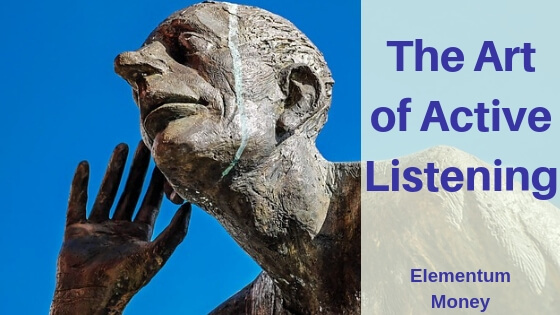 If this is the first time you have encountered the term active listening, this section should help. Passive listening is when you are physically present but barely have your brain engaged in the process. For instance, when one of my erstwhile boss used to start ranting about some things repeatedly, I used to zone out, my pupils dilated and my responses turned to nodding or just muttering a “Hmmmm”. So much so, that my junior team member had started figuring out the exact moment when I switched from active to passive listening. In my case, passive listening is often easily visible to people who know me well but thankfully rarely to the speaker. However, so many of us unconsciously end up knowing how to do only the passive part of listening. We believe we are there at the moment, while most of our attention is grabbed by one of the tasks we might be simultaneously working on in the misguided notion of being uber productive or we might simply be switched off mentally. Active listening, on the other hand, requires a person to use full concentration, focus and energy to the speaker and the words being spoken. The listener is supposed to be processing all the words, thinking about it, responding with questions or doubts and essentially engaging in a meaningful conversation from which both, the speaker and the listener walk out feeling enriched. While active is definitely the more important and meaningful type of listening, I believe passive listening can also play a role. Suppose you have a family member or even a boss giving you a hard time, you could choose to have every word carved in stone on your brain, only to be recalled every time you see the person. Or you could choose to consciously zone out in an attempt to not let the words impact, while still giving the impression of the speaker being heard. As my maths teacher in school used to say when declaring our ominous future careers if we did not pay attention in her class – the choice is yours. In a world governed by social media likes, it is so easy to fall into the trap of believing that you live in a world custom made for you. At times, it is important to tell yourself that you are finally only a speck in the world made of so many varied people. So yes, it’s not all about you. When you expect people to pay attention and listen to you as you talk, courtesy demands that you extend the same gesture to other people. As Elton John sang for Lion King, it’s the circle of life. One of my mantras is to always stay curious and be a continuous learner. While a lot of the things people or even clients might talk about may not add value, I owe it to myself to listen to it and then let my brain do the filtration process. Often, a lot of interesting aspects of a conversation stay with me for long whereas others are easily discarded. In my experience, it makes for an enriching experience. Thankfully enough, we have not inherited a homogenous world. As I mentioned earlier, we could choose to stay in our echo chamber or embrace the idea of different opinions on varied subjects. When you listen actively, you are bound to be far more open to observing varied mindsets and trying to understand how people think. I believe I have an enhanced appreciation of this fact through the numerous interview-based market research assignments I got to do in my previous role, where as a moderator at times, the idea was to actively listen while encouraging the respondent to talk. When you start listening actively, one of the bonus factors that automatically gets added in is a better sense of body language. The main input into body language is a good sense of observation. With active listening, if all you are doing is letting your ears take in the words and watching the gestures or facial expressions of the speaker, over time there will be quite a bit of unspoken communication that you will start engaging in. In my current role I often meet some clients multiple times. It’s only when I am listening to them actively that I am able to recall vital facts about them or their lives. In any follow up meetings, clients are bound to trust you more when you recall conversation points or facts about them as it shows your involvement in the relationship. And as I have come to understand, most of investing and financial services hinges on building relationships. While the previous point talks more about trust and active listening in more of a professional setup, it is even more important in personal relationships. How many times have you heard wives complaining that their husbands just don’t listen to them? Ok, that might be a tad sexist. But, enough and more close relations can often get the feeling that your ears are for decorative purposes only unless you adopt the habit of active listening. How can you improve your Active Listening skills? I hope that with the section above I have been able to show just how important active listening is. Whatever the commitment levels to improving your listening skills, you can always use some of the below tips to enhance them even further. When someone is talking to you, show the speaker enough respect to not be using your attention for any other purpose. Listening while checking out your phone or even planning your day in your head does not help. While it may not be possible every time, keep working to increase the percentage of times when all you are doing is putting your focus solely towards listening to the other person. This is not easy. I confess I often hear someone talk about something, link it to something in my head and have the urge to stop them right there to connect it to what I was thinking or have experienced earlier. In fact, I have often given in to this temptation. While doing it sometimes is still fine, the more you do it, the more the speaker is bound to lose his or her train of thought and the conversation to break in parts. Listening can happen better when the conversation is deeper. To encourage deeper conversations and even give a hint that you are actually listening to the person, ask questions. I have realized that even repeating something to confirm a detail often takes a conversation to a different tangent weaving lingering webs. Do you make a conscious effort to listen better? Or would you rather be the talker at all times? What do you think about the under appreciated art of listening? Let me know in the comments below.